Shaky Manor is a game by Daniel Skjold Pedersen and Asger Harding Granerud, published by Blue Orange Games. It is for 2-4 players. In this game, players will take on the role of treasure hunters as they try to collect the hidden treasure from the local haunted house. They’ll have to be careful though as lots of spooky creatures will be trying to keep them from escaping the manor with their ill gotten gains. The player that can best maneuver themselves through the manor with the treasure will be declared the winner. To begin, the boxes should be set up so that each of the walls match the floors for each room. Each player takes a Shaky Manor box along with a meeple, 2 ghosts, 2 eyes, 2 spiders, 2 snakes and 3 treasure chests. Players will set up their boxes by placing a meeple, a ghost and 3 treasure chests randomly into them. The remaining items are placed in front of the player. The cards are shuffled and placed in a pile with the objects side face up. Play now begins. The game is played over several rounds. To start each round, players will randomly switch up all the items in the player to their right’s box. One player flips over the top card of the deck, showing a specific room. In future turns, the next player in turn order will flip over the card. Players will now race to get the meeple and the 3 treasure chests into the room pictured on the card. It should be noted however that there may not be any other items but those in the room. As soon as a player completes the task, they must then get the player to their right to double check their box. If everything is as it should be in the box and that player is the first to complete the challenge, they win the card as a point. If they are wrong, they must give back a card. The remaining players will then continue until someone is able to complete the challenge correctly. Once a player wins, the player to their right will now pick an object from those in front of the player. It is then added to the winning player’s box. A new round will then begin. The game continues until a player reaches 5 points. The first player to do this is the winner. The game also comes with a different way to play the game. Setup is exactly the same, except for two things. 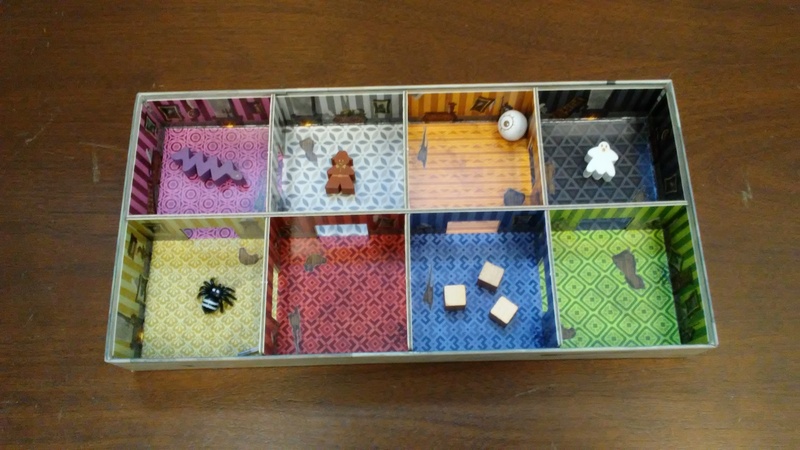 In this game, all of the objects are placed into the players box, not just a meeple, 2 ghosts, 2 eyes, 2 spiders, 2 snakes and 3 treasure chests. The other thing is that after shuffling the cards, they are placed with the room side face up instead of the objects side. For this game, both sides of the cards will be used. Before each round, players will randomly mix up their boxes and then hand them to the player on their left. To start the round, the card is flipped over and placed beside the deck. The two cards are then used as a reference. 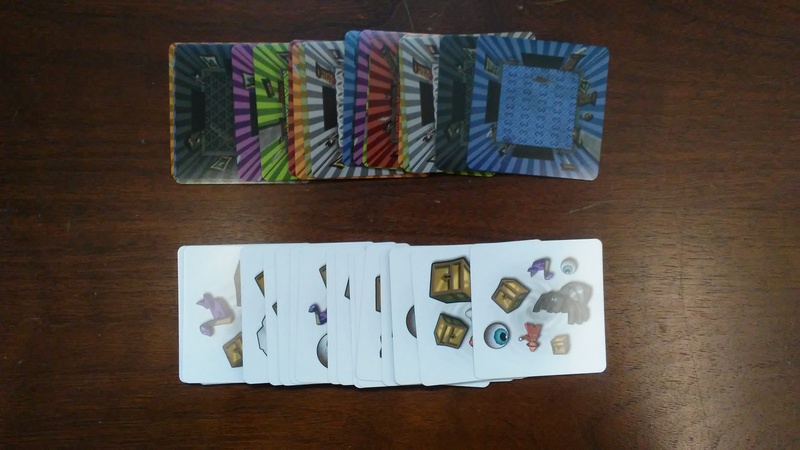 The players must now race to get all the objects pictured on the flipped over card into the room pictured on the other card. Just like before, no other items may be present in the room. Once a player completes the challenge, they must get the player to their right to check to see if they are correct. If they are correct and the first player to complete the challenge, they win and receive the card as a point. If they’re wrong, they must give a card back. The remaining players will then continue until someone is able to complete the challenge correctly. A new round will then begin by flipping over a new card to reveal a new set of 2 cards. The game continues until a player reaches 5 points. The first player to do this is the winner. The game comes with 4 large cardboard boxes that have dividers which separate the box into 8 colored rooms. The cardboard is quite thick, especially on the actual box itself. The colors and patterns are easily distinguished from each other, so there’s no worry that you might misunderstand which room is which. The walls have cut outs in them so that the different objects can be slid around inside the box. The game also includes a large selection of objects, most of which are wooden. There are meeples, ghosts, eyes, snakes and treasure chests that are all made of wood. There are spiders that are rubber. The meeple is dark brown and has some highlights that make it look like an explorer of some kind. The ghost has some little gold highlights on it, as does the eyeball. The ghost is also a meeple. The eye is a round ball. The snake is purple and is a zig zag piece of wood with a gold eye. The treasure chests are wooden cubes that are painted gold. The spiders are black rubber with white highlights painted on. The cards aren’t normal playing card size but are smaller and square. One side of the card shows the room, while the other side shows a selection of different objects. The cards are a good thickness and have a nice finish on them that makes them easy to shuffle. I think the different pieces are silly and fun looking, while the boxes are a good size. They are easy to manipulate and move around. Each piece moves around quite well inside the box, which is good. Overall I think everything looks and feels good. The rulebook for this game is a large double sided sheet of color paper. It has several pictures and a couple of examples on it. The rules are pretty much straight forward, so there’s nothing too difficult to understand. Everything seems to be laid out pretty well. With the rules on only 1 sheet of paper, everything is easy to find. The rules include 2 different ways to play the game and an additional variant for the 2nd game. There’s nothing overly fancy or jaw dropping about the rulebook, but then again there’s nothing bad about it either. Of course once you understand the rules, there’s not much need to look back at the rulebook, except maybe to see how many of each piece is placed into a player’s box for the first game. Overall I think the rulebook gets the job done and looks good too. I remember when I was a kid there were these plastic mazes that had little ball bearings in them. The idea was to get the ball bearing from the entrance of the maze to the end of it by turning and tilting the maze back and forth. Those things were always entertaining and were good for killing time. In a lot of ways, this game reminds me of those little plastic mazes. Through the course of the game you’re tilting and turning, shaking and bumping your box to try and get the different pieces where you want them. Of course the more pieces that are in the box, the more difficult it is to get each one where you need it to go. As an adult, I have the patience and ability to gently guide each piece around the box. My daughter on the other hand is like a bull in a china shop. She will shake and turn that box back and forth, many times putting more items in her way than out. Of course she still has fun moving the pieces around. That’s what this game is, moving pieces around in your box until you get the right ones in the right room. The thing is that you’ve got other players trying to do the same thing at the same time and only one of you can win. Some things move a bit slower, like the snake or the spider, but the eyeball can be a real pain. One minute it’s way up in the far corner, and the next it’s rolled all the way into the room you’re trying to complete. This game is one that I think kids will enjoy. It’s family friendly and easy enough that all age groups can play. Adults that enjoy dexterity games should find this interesting enough, especially those adults with kids. Fans of dexterity games like Jenga or Maki Stack should enjoy this one as well. While this isn’t one of my most favorite games, as I’m not big on dexterity games, I can still appreciate the fact that my daughter enjoys it. To me that matters the most. I think there are plenty of people that will enjoy this one. This is one that I’d recommend giving a try. You very well may enjoy it. 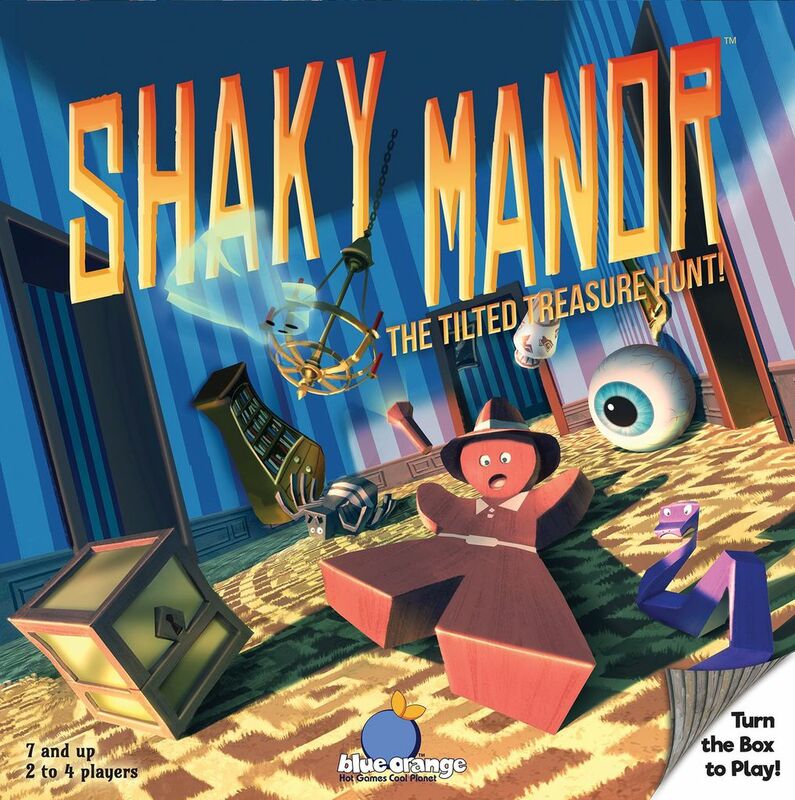 Shaky Manor is a dexterity based game of moving and shaking for the whole family. The game doesn’t take very long. Most game sessions last around 15-20 minutes. The components are very good. I like all the many different pieces and how well the pieces are made. They are fun to look at and manipulate. The rulebook isn’t very complex, but then neither is the game. I think that the rulebook works for the simplicity of the game. The game itself is one that kids of all ages should enjoy. The fun of moving all the pieces around and trying to get them in a particular room reminds me of the old plastic mazes with the little ball bearing inside them. My daughter likes how everything works and she seems to enjoy the game a good bit. Fans of dexterity games like Maki Stack and Jenga should probably enjoy this one as well. This is a family friendly game that is easy enough for old and young players alike. This is one that I would recommend giving a try. While it’s not necessarily my cup of tea, it’s definitely one that the kids will enjoy. This is one game that’s meant to be shaken, not stirred. For more information about this and other great games, please check out Blue Orange Games at their site. This entry was posted in Reviews and tagged asger, Asger Harding Granerud, blue, blue orange, blue orange games, board, board games, card, card games, daniel, Daniel Skjold Pedersen, games, granerud, harding, manor, orange, pedersen, shaky, shaky manor, skjold. Bookmark the permalink.